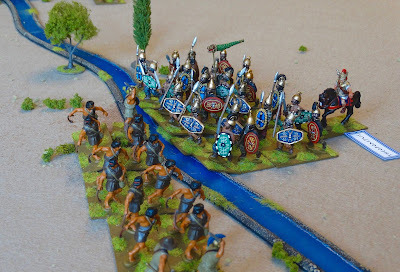 A very welcome email from my old wargames buddy Steve gave me the chance recently to set up another ancients game. 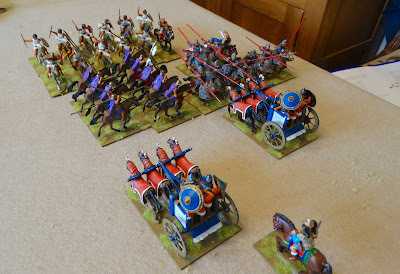 I would be able to move on from the Trimsos scenario and also give a couple of new units their baptism of fire. The new battle would be based on an 18th century scenario posted on the HoW website some time ago - you can see the original here. 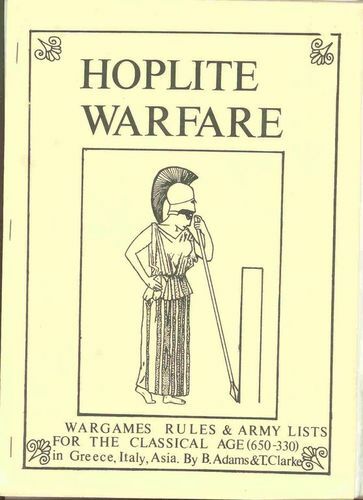 Thanks as usual to our prolific HoW poster Damnitz for this excellent game idea. 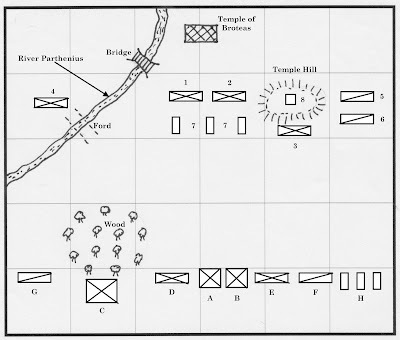 The map shows the set-up as adapted from the original - each map square is 1' x 1'. The forces of Paphlagonia are attacking a small Latium army defending the river crossings near a disused temple. The river is low at the moment, but by autumn it will be in full flow and the crossings will be vital. I would command the Army of Paphlagonia, whilst Steve led the Army of the Kingdom of Latium. North is to the top of the map. The Battle Of The Temple Crossings. 10 units. 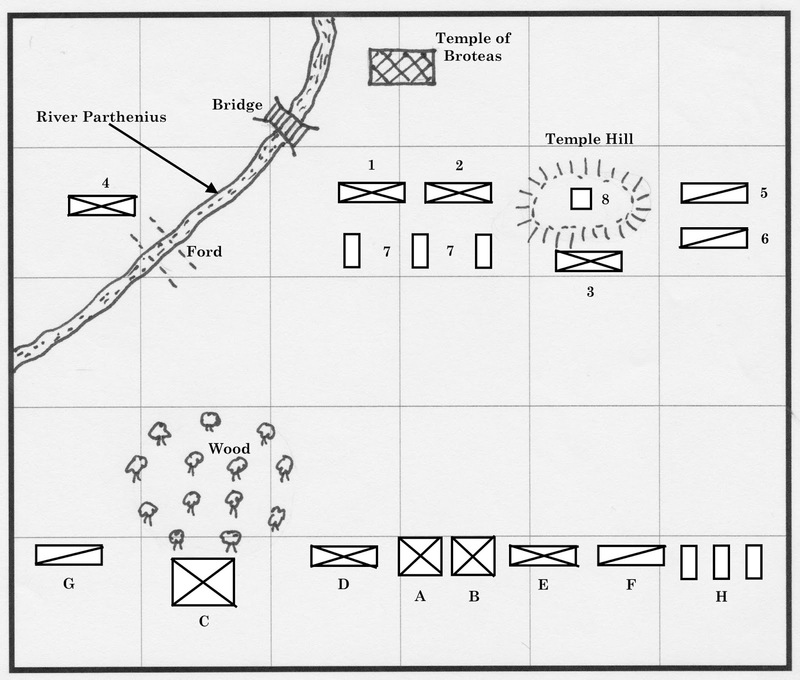 Army Break Point 5. The Paphlagonian army can set up within 1 foot of their baseline, the Latium army within 2 feet of theirs. Temple Hill is gentle, the River Parthenius is crossable. 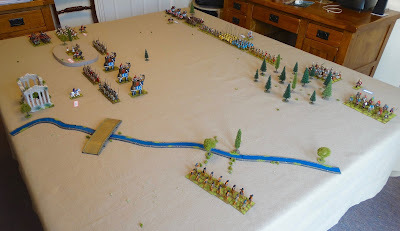 The first army to reach its army break point loses. 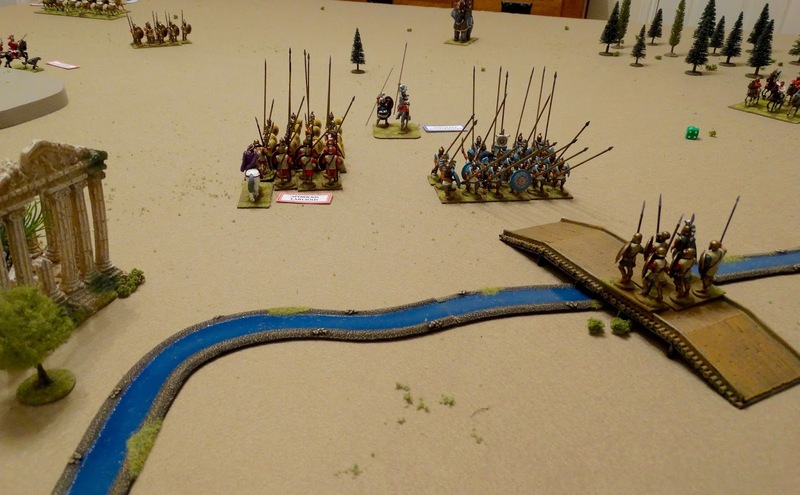 Each river crossing lost loses the Army of Latium one army point (equivalent to losing one unit). I set the figures out in advance to save time. 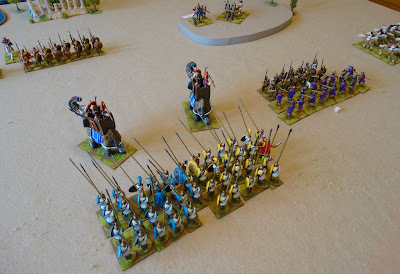 The army of Latium is nearest the camera. Only a single unit of light infantry is west of the river. The Latium elephants advance, with a mission to disrupt the powerful Paphlagonian pike phalanx. Two units of the Kingdom Infantry are in support. The crunch approaches. The Paphlagonian right wing is also making a determined advance. 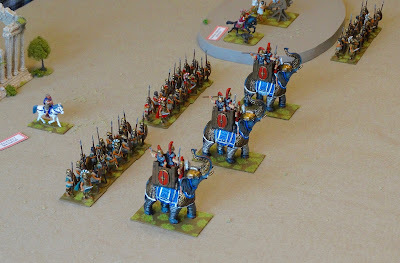 and the elephants are easily dispatched. On the right, the Serpent's Tongue javelimen are putting up a stout fight against a regiment of the Kingdom Infantry, but ultimately they were doomed. A confused and deadly melee takes place on the eastern flank. One chariot is already destroyed. Overview around turn 3. 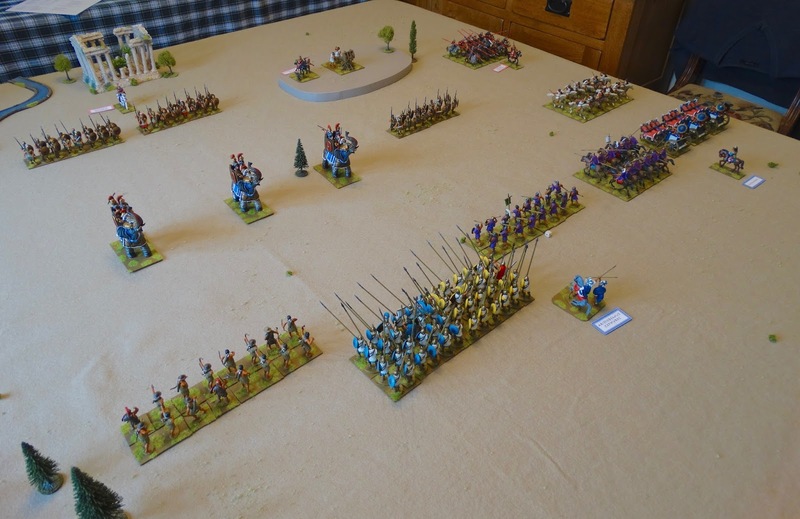 The Blue and Yellow Shields own the centre of the battlefield, whilst the Galchobar Warband clear the wood and find little opposition ahead of them. However, the 100 Suns mounted archers, attempting a sally towards the ford, have been smartly seen off by the Latium slingers, and can be seen licking their wounds at the right of the photo. flanking fire from the bolt thrower, but so far they have shrugged off the casualties. Meanwhile at the ford an unequal contest between the Na'Arun slingers and the attacking warband commences. Sensibly, the slingers give ground, hoping to fight a delaying action. But Paphlagonia now have the ford. one hangs on bravely, the other retreats to the bridge. Steve had to depart after 5 moves, and at this stage Latium were actually ahead, having lost only 2.5 units to the 3.5 units lost by Paphlagonia. 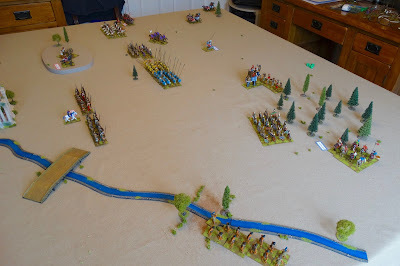 However, as neither side had yet broken, I decided to play out one more turn solo, which was hard fought and decisive (see the last two photos). 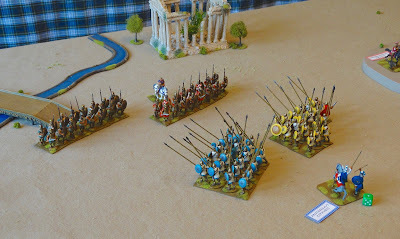 The Blue and Yellow Shields charged and defeated the opposing units of the Kingdom Infantry, whilst the warband took the ford which cost Latium another Army Point. The Auricomus cataphracts were also destroyed in this turn as the lengthy fighting on the eastern flank turned in the favour of Paphlagonia. 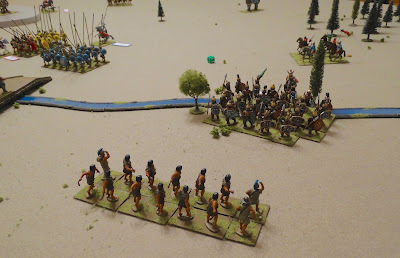 Suddenly, Latium had lost five Army Points and were broken, whilst Paphlagonia had just held on, with a total of 4.5 army points lost. I must say I was particularly pleased by the sturdy performance of my pike units, as the Blue and Yellow shields trudged implacably across the table defeating all before them. Good work lads! 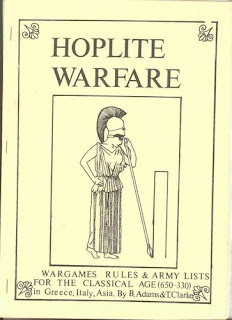 An excellent game had resulted, with plenty of useful lessons learnt about the rules. 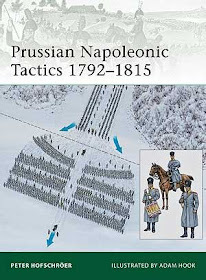 Only one sour note was struck, when Steve was firing his bolt thrower against the flank of the advancing Yellow Shields. "Do I get grazing fire for a bolt thrower? Those Blue Shields are in the line of fire!" was the question. Fortunately, at heart Steve is every inch a gentleman and a stern glance was all that was required to end this embarrassing interjection. Bouncing bolts! What next!